Peace Corps Online: January 21, 2005: Headlines: Presidents - Bush: Inaugural: Speeches: Detroit Free Press: In Inaugural Address, Echoing John F. Kennedy, Bush wants young Americans to serve their country, but while Kennedy formed the Peace Corps, Bush hasn't said what he means. January 21, 2005: Headlines: Presidents - Bush: Inaugural: Speeches: Detroit Free Press: In Inaugural Address, Echoing John F. Kennedy, Bush wants young Americans to serve their country, but while Kennedy formed the Peace Corps, Bush hasn't said what he means. Peace Corps Online: Peace Corps News: Special Reports: January 18, 2005: Ask Not: January 21, 2005: Headlines: Presidents - Bush: Inaugural: Speeches: Detroit Free Press: In Inaugural Address, Echoing John F. Kennedy, Bush wants young Americans to serve their country, but while Kennedy formed the Peace Corps, Bush hasn't said what he means. In Inaugural Address, Echoing John F. Kennedy, Bush wants young Americans to serve their country, but while Kennedy formed the Peace Corps, Bush hasn't said what he means. 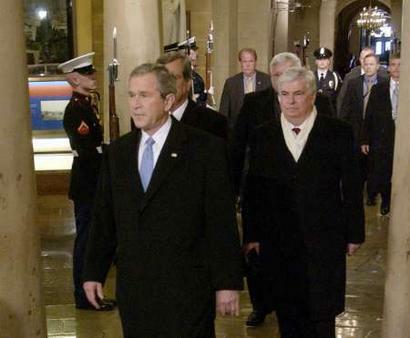 Caption: U.S. President George W. Bush (L), accompanied by Senator Christopher Dodd (D-Ct) (RPCV Dominican Republic), walks through the Crypt of the U.S. Capitol Building on his way to take the oath of office to begin a second term, in Washington January 20, 2005. WASHINGTON -- Embarking on a second term with the nation at war abroad and divided at home, President George W. Bush pledged Thursday to foster freedom in the "darkest corners" of the world and to rekindle the national unity that flourished after the Sept. 11, 2001, attacks. "The best hope for peace in our world is the expansion of freedom in all the world," he said, linking his foreign and domestic agendas at the start of his new term. SECURITY: "The survival of liberty in our land increasingly depends on the success of liberty in other lands." Analysis: Fostering democracy abroad is necessary to protect America from its enemies. This raises questions about how he intends to spread democracy to nations such as Iran and North Korea and conceivably China, Egypt, Russia and Saudi Arabia. HANDS OFF: "America will not impose our own style of government on the unwilling. Our goal instead is to help others find their own voice." Analysis: He's reassuring the world that he doesn't intend to implant freedom in other nations by military means, but rather will encourage human rights by standing up for them. His preemptive war in Iraq alarmed much of the world that America under his leadership was a bully, and he was trying to ease those anxieties. FRIENDS: "All the allies of the United States can know: We honor your friendship, we rely on your counsel, and we depend on your help." Analysis: Bush intends to reach out to traditional U.S. allies in his second term who were alienated by his war in Iraq and unilateral actions that many considered arrogant. 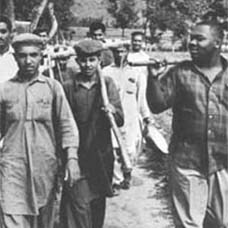 DEFENSE OF ACTIONS: "Because we have acted ... tens of millions have achieved their freedom. ... By our efforts, we have lit a fire as well -- a fire in the minds of men." Analysis: Wars in Afghanistan and Iraq brought freedom to millions of people. However, Afghanistan and Iraq remain mired in violence. Still, Bush hopes those examples will inspire people elsewhere to seek democracy. CHALLENGE TO YOUTH: "I ask our youngest citizens to believe the evidence of your eyes. ... Make the choice to serve in a cause larger than your wants, larger than yourself -- and in your days, you will add not just to the wealth of the country, but to its character." Analysis: Echoing John F. Kennedy, Bush wants young Americans to serve their country, but while Kennedy formed the Peace Corps, Bush hasn't said what he means. DOMESTIC PUSH: Bush cited the Homestead Act, the Social Security Act and the GI Bill of Rights as illustrations of what he termed "the broader definition of liberty." Analysis: His plans to overhaul Social Security, mandate education standards and "build an ownership society" aim to serve the conservative Republican ideology of reducing people's dependence on government and encouraging self-reliance. FAMILY AND FAITH: Bush said the nation's character "is built in families, supported by communities with standards and sustained in our national life by the truths of the Sinai, the Sermon on the Mount, the words of the Koran and the varied faiths of our people." Analysis: Bush took pains to include references to several religious traditions in acknowledging America's diversity and countering charges that his war against terrorism is a war against Islam.